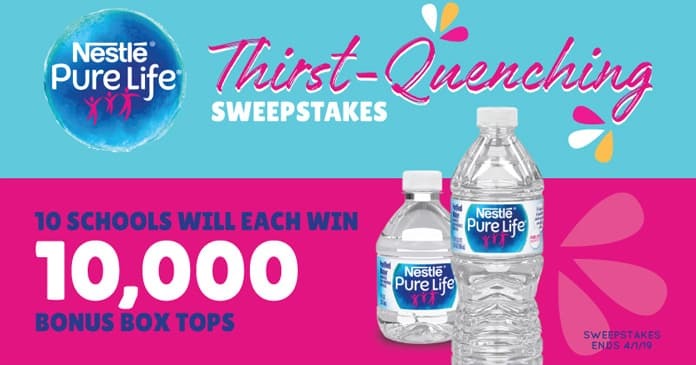 Participate into the Box Tops for Education Thirst Sweepstakes daily through April 1, 2019 and you could win big. Up to 10 schools will each receive 10,000 Bonus Box Tops. The Box Tops for Education Thirst Sweepstakes is open to legal residents of the 50 United States and District of Columbia, 18 years of age or older who are members of BoxTops4Education.com. The Sweepstakes begins at 12:00 A.M. CST on February 18, 2019 and ends at 11:59 P.M. CST on April 1, 2019. Sweepstakes entry limited to one (1) entry per person and per email address per day throughout the Sweepstakes Period. The grand prize consists of 10,000 Bonus Box Tops. Visit www.boxtops4education.com to enter and see Official Rules for details.